Once you install jShareEasy your visitors will be able to share your content on their social media of choice and thus increase the popularity of your site. 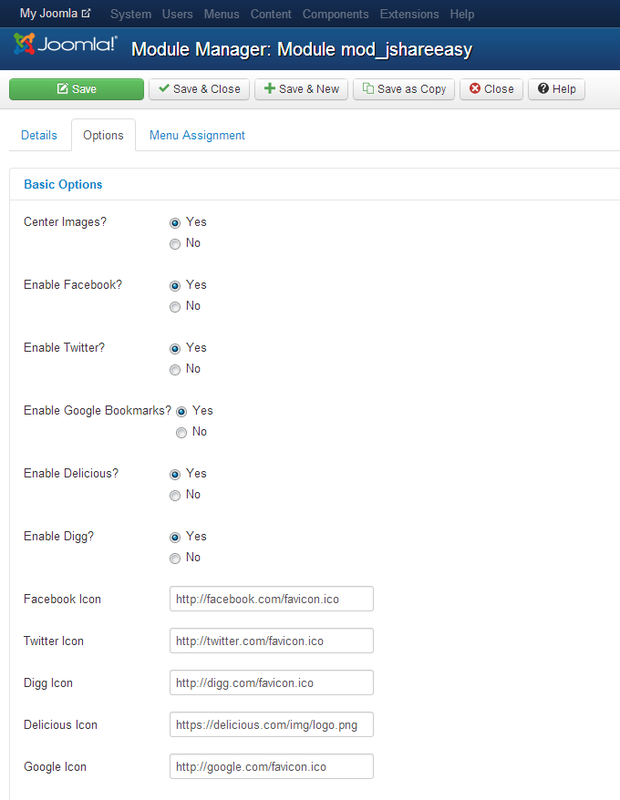 This Joomla sharing module is highly customizable. You can easily choose where to place it, which social networks to be included into it and even customize the used social media icons if you want. 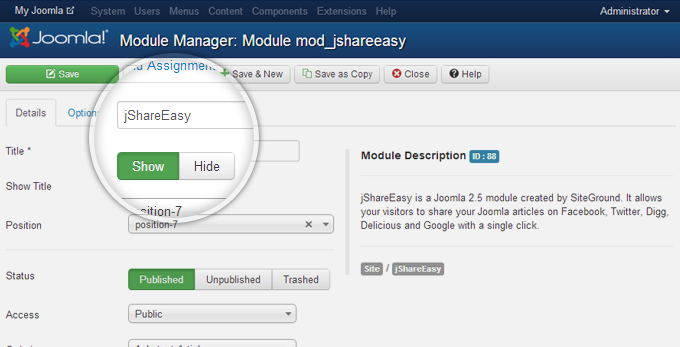 Thus you can fit the jShareEasy module in every Joomla template. 1. Download the module to your local computer. Get jShareEasy for Joomla version 2.5 or higher now! If you are still using Joomla 1.5 you should download jShareEasy for Joomla 1.5. However, we strongly recommend that you upgrade your Joomla to 2.5 or higher. Jooomla 1.5 is no longer supported and using it is not secure. 2. Upload jShareEasy to your Joomla. Once you have the plugin downloaded, you need to login to your Joomla admin panel, go to the Extensions Manager and upload the zipped jShareEasy package that you have downloaded to your local machine. 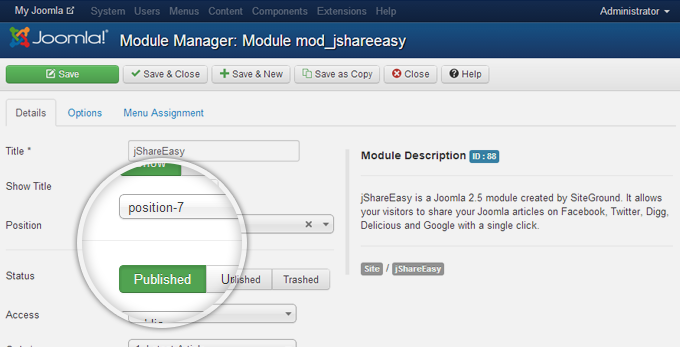 Uploading jShareEasy through Joomla extension manager. 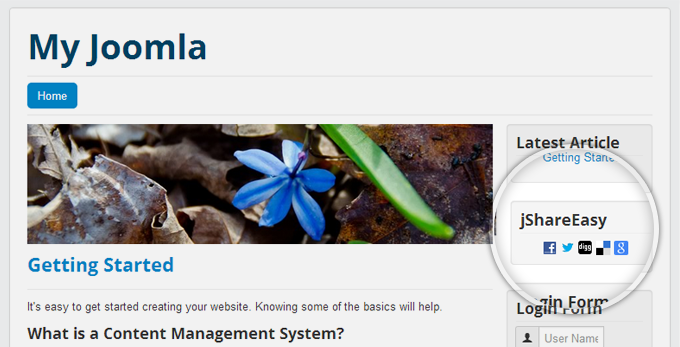 For detailed instructions check out our How to Install Joomla Extensions tutorial. After installing jShareEasy you will be able to find it listed in the Module Manager. If the module list is too long, use the search option. Once you locate the Plugin in the list click on its name to see the details about jShareEasy. Locating jShareEasy using the search function in the Joomla Module Manager. 1. Choose position and publish. Once you access the jShareEasy module manager you should choose a position for the share box that is supported by the template you use and change the status of the module to published. 2. Choose pages on which jShareEasy will be shown. 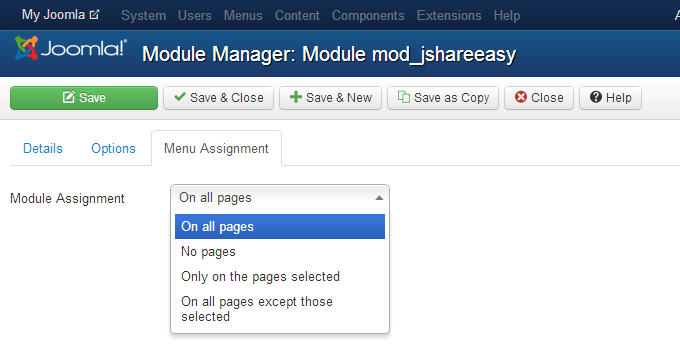 Make sure you have assigned the module to the pages you want it to be displayed. You can choose whether the box with the sharing icons will have title on your site and what will this title be. Sharing icons centered or not centered. Choose if you want to center the icons in the box or not! You can use which of the following social media to be linked in the share box: FaceBook, Twitter, Digg, Delicious and Google. The plugin also includes default icons for each social site, but you can edit the path and include another image if you need to.